Brooke Hogan blows everyone out of the water with this acoustic version of her single "Hey Yo!" which features Colby O'Donis. Colby plays the guitar, and their lives vocals are just perfect! Check it out - Brooke is so underrated! Here's the debut video from Eva Simons for her single "Silly Boy". The song is pure HOTNESS and will be a big hit I think! Check it out. Fresh off her debut single going straight to #1 in the UK, Pixie Lott is back with the next single ~ BOYS & GIRLS. The song is H-O-T but the video isn't as good as the "Mama Do"clip. Take a look! It's Kelly Clarkson's new video for her latest single "Already Gone". The video is great, and the song is lovely - written by the powerpop legend Ryan Tedder! Take a look. Katie Holmes performs "Get Happy"
Here's Katie Holmes on last night's So You Think You Can Dance, dancing and singing to "Get Happy", made famous by Judy Garland. The performance was absolutely sensational and proved what a great talent Katie is. Flawless! 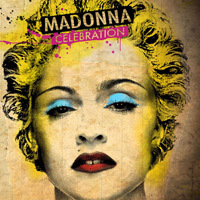 Here's the official cover for Madonna's upcoming greatest hits, titled "Celebration". Beverley Knight is BACK! Her new single is out 7th September, followed by her new album "100%" out September 14th. Love this new sound! Chris Brown has finally broke his silence about his assault of Rihanna. He aplogises (to Rihanna and his fans) in this video and admits he was wrong and it won't happen again. Great viewing, check it out. T4 on the Beach was held yesterday at Western Supermare beach, and one of the headline acts were the Saturdays. They performed "Work" and "Up" and above you can see their live performance of their smash hit "Up". Check it out! Catch this interview on U.S. television with LeToya Luckett. She talks about her new album and singles, acting career and possible reunion with Destiny's Child...! Lady GaGa performed "Paparazzi" live on GMTV and gave a little interview with Lorraine Kelly beforehand. Check it out ~ the performance was amazing. Here's the official music video for Cassie Davis' new single "Do It Again". I love this girl, and the song is great - it's taken from her upcoming debut album "Differently". Shakira has revealed that she decided to concentrate on the dance genre when recording her new album. The 32-year-old singer realised that she wanted to transform her sound after teaming up with Pharrell Williams for her latest studio disc, which is due out on September 21. Speaking to the Daily Star, she explained: "It's all about the bottom end. I really wanted to explore different dance beats and cultures on the new record. I did my research and looked into different kinds of rhythm. Plus Pharrell is a genius with beats so it came together really fast." She added: "I'm always trying new things. It's important for me to keep interested. But the main thing was I wanted to be able to dance to this record." The star is also preparing for the release of her new single 'She Wolf', which is expected to be the album's title track. Shakira commented: "It's about a domestic girl who breaks free. I think we all have the wolf in us ready to come out." Kristinia DeBarge - Debut album info! Kristina DeBarge's will release her debut album on July 28th in the U.S. and the details have been revealed on amazon.com. The debut set will feature 11 tracks including singles "Goodbye" and "Future Love". Check it out! Check out the premiere of Beyonce's new video for "Sweet Dreams". It's pretty good! "Fast Life" is the second single from Hadise's new album of the same name. I love the song and the video is really cool too - check this one out! Kelly Clarkson performs Janet's "If" LIVE. Check out this performance by Kelly Clarkson at a recent concert. She covered Janet Jackson's hit single "If" and in true Kelly style, gave the classic R&B/Dance song a rock twist. Check it out, a big true hommage to Janet. Madonna tribute to Michael Jackson! Michael Jackson was honored by Madonna at her Sticky & Sweet concert... check it out! Here's the first play of Jade Ewen's single "My Man". The track is a massive departure from her debut single "It's My Time", which went top 30 in the UK and came 5th place in this year's Eurovision Song Contest. Check it out!! Whitney's comeback single - hit or miss? Check out Whitney Houston's new single "I Didn't Know My Own Strength" in the youtube video above. Whitney's new album drops September 1st. Tentative title: "I Look To You". Michael Jackson - last rehearsal video. Check out this exclusive video showing Michael Jackson's last rehearsal for his would have been tour "This Is It". The performance shows MJ rehearsing for "They Don't Care About Us", proving the star was in great shape and the tour would have been simply fantastic. "Not For You" is the 4th single from Natalie Bassingthwaighte's "1000 Stars" album, and you can view the single's video above! Here is Michelle Williams talking about Michael Jackson and his death and legacy on SKY1 News. New Britney Spears video for latest single "Radar". Check it out before Youtube deletes it!